LGBT activists say they filed a complaint demanding Russian authorities open a criminal investigation into the alleged detention and torture of people as part of a suspected anti-gay campaign by security forces in the Russian republic of Chechnya. The LGBT Network, a St. Petersburg-based group, said in a statement it submitted the complaint to the Investigative Committee, Russia’s rough equivalent of the FBI, on Tuesday, asking it to probe the alleged detention of at least 14 people, as well as torture and at least one murder. The move is an attempt by the group to compel Russian authorities to act on reports of a new wave of detentions and torture targeting the gay community in Chechnya, a predominantly Muslim region in southern Russian ruled by dictatorial leader Ramzan Kadyrov. Earlier this month, the LGBT Network claimed at least 40 people were detained and two killed in what they fear is a renewal of a campaign of persecution in Chechnya that in 2017 saw dozens of gay men rounded up and brutally tortured. As in 2017, Chechen authorities denied the reports, largely by asserting that homosexuality does not exist in Chechnya. Igor Kochetkov, the LGBT Network’s director, told ABC News that the 14 cases in the complaint accounted for just those people reportedly held in one police station in Chechnya’s capital, Grozny, and that they had information that others were being held elsewhere across the country. 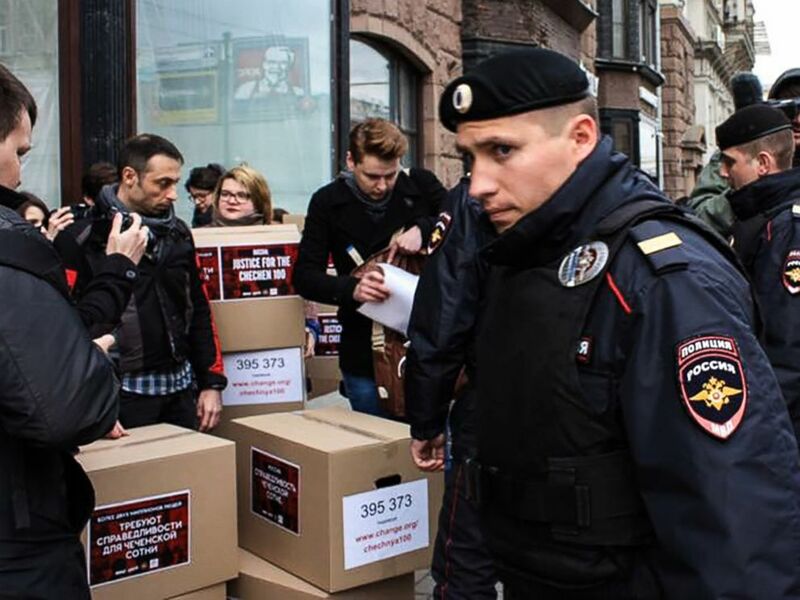 Russian policemen surround Russian gay-rights activists standing next to boxes allegedly containing signed petitions calling for a probe into a reported crackdown on Chechnya’s LGBT community, during a rally in central Moscow on May 11, 2017. “We believe several dozen people are detained, no lower than 40,” Kochetkov said by phone. The LGBT Network helped dozens of gay men flee Chechnya in 2017, with many eventually finding asylum abroad. The group is trying to do the same this time, but it is harder because police are now blocking victims by seizing their passports, Kochetkov claimed. According to the activists, the new detentions began after police arrested the administrator of a social media page popular with LGBT people in the region and began going after contacts in his phone. Unlike in 2017, police are also arresting women, Kochetkov said. The activists identified two police sites in Grozny where people were allegedly being detained: a police station on Popovich Street and the local Ministry of Interior building. Kochetkov claimed others were also held in the town of Argun, a key site in the 2017 round-up. For the first time, the group named one of those allegedly detained: Bekhan Yusupov, who Kochetkov said remains imprisoned. The accounts closely recall those that emerged in 2017. Then, a man, identified for his safety by ABC News under the pseudonym Dmitry, claimed he was held for several days with others in cells deprived of food and water, beaten and hooked up to a battery. Kochetkov said those allegedly detained this time described being raped with electro-shockers and that men were shaved and forced to dress in women’s clothes. The activists blamed Russia’s federal authorities for the new persecutions, saying their failure to intervene in 2017 created a sense of impunity in Chechnya. 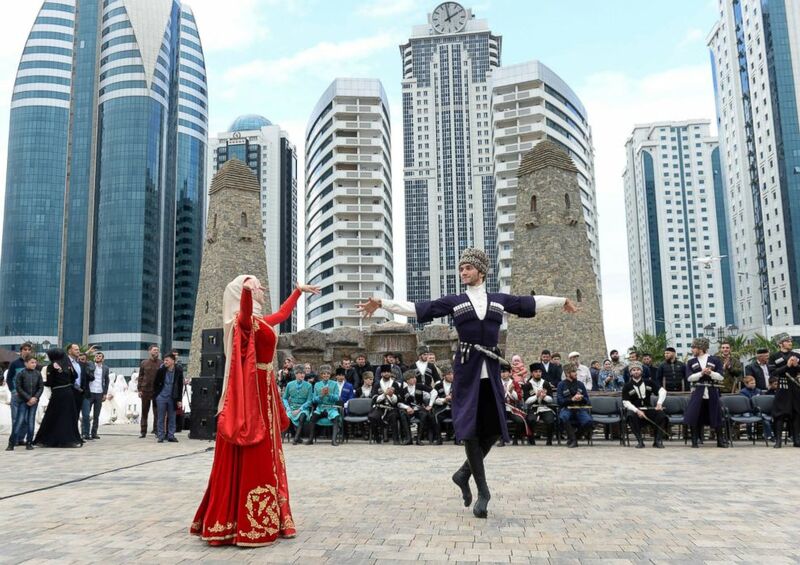 Dancers wearing traditional costumes perform during celebrations to mark the 200th anniversary of the Chechen capital of Grozny, Russia, Oct. 5, 2018. Following heavy international criticism then, Russian federal authorities opened a criminal probe, but it has since gone nowhere. A Russian man, Maxim Lapunov, who publicly described being tortured in October 2017, also filed a criminal complaint to the Investigative Committee. But the committee declined to open a criminal case, and in November a court rejected Lapunov’s appeal against that decision, saying it was lawful, the investigative newspaper Novaya Gazeta reported. Activists demanding an investigation were arrested in 2017. The U.S. State Department said in a statement this month it is “deeply disturbed” by the reports, calling them “credible” and demanding Russia act to meet its international obligations. The LGBT Network said it has helped around 150 people leave Chechnya since 2017 and that about 130 of those had managed to go abroad. Rainbow Road, a Canadian-based group, said it has brought around 57 people to Canada.